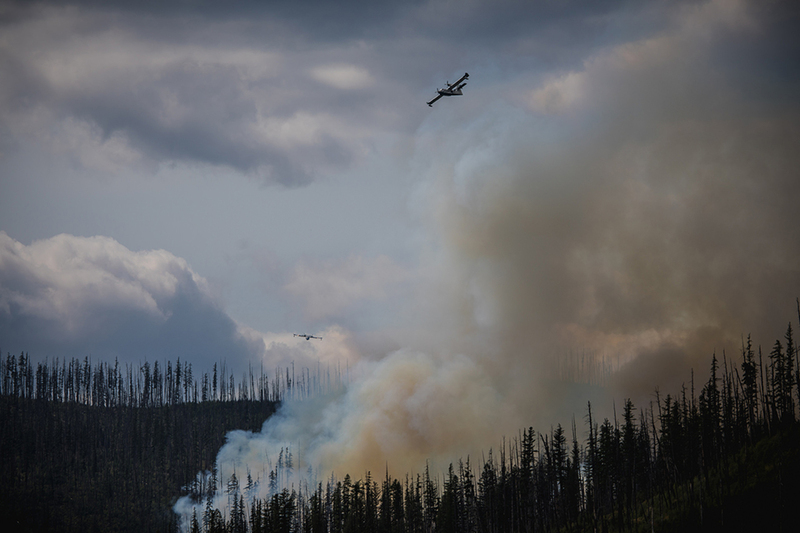 Howe Ridge Fire Update, August 13, 4 P.M.
Get the latest news releases from the Park by tapping here. Active interagency firefighting efforts continue on the Howe Ridge Fire, now estimated between 1,500-2,500 acres. A local Type III Flathead County Interagency Team is assisting the park in efforts to check the spread of the fire and continue to protect structures. A Type I team will be assuming command of the fire later in the week. Flathead County fire departments were instrumental in protecting structures along North Lake McDonald Road. While multiple buildings were saved, a number of structures were lost last night. Exact details are not yet available. This afternoon, two CL-215 (Canadian “superscooper”) airplanes and a K-Max Type I helicopter are dropping water from Lake McDonald on widespread spot fires and are working to establish a secure anchor point from which to fight the fire. Multiple structural engines and wildland engine crews are protecting structures and working to suppress spot fires. Crews and engines will remain through the night to protect structures where they can do so safely. The fire is staffed with approximately 60 personnel. While winds have been moderate today, conditions remain hot and dry. Fire season in Northwest Montana is expected to continue into September. The Going-to-the-Sun Road is closed between the foot of Lake McDonald (near Apgar) and Logan Pass. The road remains open between St. Mary and Logan Pass. The Inside North Fork Road has also been closed. Most other areas of the park are open. Suppression operations also continue at Numa Ridge and Heavens Peak. Smoke jumpers are making excellent progress constructing line around a 1.4 acre fire on Numa Ridge. The Heavens Sake Fire on Heavens Peak is staffed with four heli-rapellers. Multiple trail closures are associated with the fires. Please see full trail closures on the park’s website. Effective 12 a.m. tonight, the park will enter Stage II Fire Restrictions. No campfires will be permitted in the frontcountry or backcountry. Smoking is also prohibited except within an enclosed building, vehicle, developed recreation area, or barren area three feet in diameter. Propane stoves that have an on/off switch are permitted. Media access and local resident access into the fire closure area is not anticipated today.